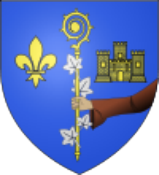 Throughout the Middle Ages, Châtillon sur Loire lived constant struggles between the power holders : kings of France, earls of Sancerre, monks of Fleury (today Abbey of St Benoît).This protestant fortified place underwent 7 attacks or sieges (1560/1590) during the wars of religion. The protestant church was one of the first built in France, then destroyed by orders of Louis the 14th. St-Maurice church, neo-gothic style from the end of the 19th century, has beautiful stained-glass windows, a polychrome wooden statue of the Virgin and Child (1628) and a gilt-wood tabernacle (1792). 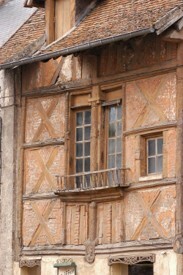 At n°4, “rue des Près”, a listed Italian renaissance style house (16th century) with two carved polychrome medallion. Typical winegrowers’ houses from the 16th and 17th centuries. (St Vincent’s road, outskirts of Nancray). Timber-frame houses in the old quarters. Château Gaillard ruins (12th century) in the upper town, timber-frame houses, alleys. 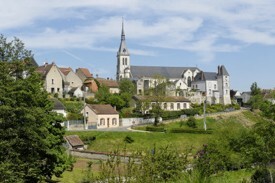 The protestant church : this building was during the 12th century, the tithe barn of St Benoit’s monks, whose Abbot was at that time Lord of Châtillon. “Ecluse et bassin de Mantelot” : Lock of Mantelot : ancient Loire crossing during the 19th century : a listed site. The junction between the canal lateral to the Loire and Briare’s canal needed a Loire crossing. The town of Chatillon-sur-Loire was chosen for the building of this lock, nevertheless it was a most tricky crossing. Monday to Friday : from 8:30 am to 12 pm and from 1 : 30 pm to 5:30 pm, Saturday from 9 am to 12 pm.